Coffee is a huge industry, but throwing away items during the creation of coffee, can be a hazardous problem. Caffeine rich waste cannot be just thrown away. It would cause issues with germination of seeds and plants. Waste needs to be decaffeinated before it could be tossed out safely. They are working on genetically modified bacteria to decaffeinate waste at the University of Texas, Austin. Fair Trade started in 1998, in the USA. It allows farmers to band together and sell directly to major corporations. Previously farmers sold to middlemen, who sold to other middlemen, each marking up the price. In the end, farmers would receive pennies for their output. With Fair Trade they get a much more reasonable payment. A product with the Fair Trade label assures consumers that the product came from a sustainable farm, and they received a fair price for their crops. The supply chain is audited from the actual farm through to the grocery store. Most of the revenue that keeps Fair Trade going is earned from this audit and certification service. Fair Trade coffee is coffee purchased usually directly from coffee growers at a fair and reasonable price. The price is usually higher than regular coffee. The growers should have better working conditions for workers as well as better economic incentives. Sustainability practices should also be better with Fair Trade coffee. The Sierra Club offered its own blend of Fair Trade Coffee for a time, which was even grown under diversified shade and the natural habitat of many song birds! Be sure to store your coffee in a dry, dark place. Do not stock up too much, as coffee is best enjoyed fairly fresh. Convenience has made Keurig and other brands of single service pod coffeemakers all the rage. Senseo and other brands have also become very popular. You do pay a premium for the coffee and more waste is created, so please recycle single serve coffee containers if possible. If you cannot recycle the K-cup, at least open it up and remove the coffee grounds and compost them. We recommend users purchase a ekobrew Cup, Refillable Cup For Keurig K-Cup Brewers. this cup is a refillable coffee filter that will save you money as well as prevent waste. How can you have more ‘green’ tea? (Pardon the pun) Drop the tea bags and use loose leaf. I noticed that the tea we have been purchasing from Trader Joe’s is not all that eco. 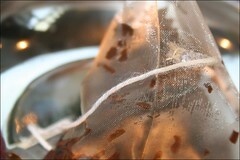 Individual tea bags are sealed up to increase freshness but create more waste. It’s all about going back to simpleness. Yes we compost the tea bags, but switching to loose leaf tea cuts out all the tea bags, individual tea bag wrapping, etc. Organic tea is even a better bet. We saw this cup at a museum store that looked like a standard coffee cup but was made with porcelain. It is called “I Am Not a Paper Cup” and is dishwasher and microwave safe, $12 from Amazon. eco cup is another similar reusable coffee cup or beverage cup. Many coffee shops will not allow you to use your own cup, claiming health code problems. Starbucks sells a $15 reusable Venti cup and applies a 10-cent discount on the price of the drink of your choice each time you bring your cup in and order. Apparently these sold out an are being scalped on eBay. I wonder how many other coffee places will let you use this. Most independent coffee shops have no problem with this. Just thinking about how many paper cups are tossed each day is mind boggling. Few people wash their coffee cups and recycle the cup and plastic top. If you brew your own coffee, use a reusable coffee filter made with hemp, cotton, or plastic that can be washed after each use.